Read our top tips on how to prepare for sending your little ones back to school whilst also taking care of yourself. We’ve heard a lot of tips from parents about buying new clothing for their children when it comes to back to school. One of our favourites was to buy two pairs of trainers or school shoes that your child likes, one in the size they currently are and one in the size above. Their reasoning for this was that children wear shoes out so quickly and their feet grow just as fast, this way you’re prepared and have a back-up pair ready to go. If you do this during back to school when the offers are on it’ll make it cheaper and you’ll thank your past self when your little one is running around in holey trainers that are on the small side. If you want your child to come home with everything that belongs to them or have some hope of getting any missing items back, label everything. It’s great to aspire to be one of those mums who hand sews personalised labels into her children’s clothing. However, frankly just to remember to scrawl our surname on the garment labels in biro is winning. On the other hand, if you want to do this like a grown up then you can’t go wrong with the personalised name stamps from Easy2Name. Packed lunches don’t have to be boring and unhealthy. Be imaginative and make them colourful by including lots of fruit and veg. Here’s our top tips on making your children’s lunches delicious and healthy: – Avoid fizzy and high sugar drinks – choose water and add berries or slices of lemon to it to make it tastier and more appealing to kids. – Ditch crisps for veggie sticks – chop up carrots, cucumber and peppers to provide a crunchy but healthy snack. Include a little tub of hummus or a similar dip to make them a little more interesting. – Lunches don’t just have to be sandwiches – try wraps, pittas, flat breads or homemade pizza slices topped with veg to give lunches more variety. Pack sandwiches with your child’s favourite salad along with ham or cheese, to help get your little ones 5 a day in and keep them full. – Sweet treats – dessert doesn’t have to be chocolate, fill a little pot with your kid’s favourite fruit or blend berries with natural yogurt to make a healthier version of children’s high sugar yogurt. – Disguising fruit and veg – OK, so your little one may be fussy when it comes to eating any fruit and veg so try disguising it or making it more appealing. Cut fruit and veg into fun shapes like stars and hearts, hide it in meals they do like so putting plenty of vegetables in homemade sauces with pasta or on pizza or blend fruit into yogurt as mentioned above. Don’t forget to take care of yourself during the back to school period, it can be very stressful and you need to remember to take some time out to unwind. We recommend running a bath after putting your little ones to bed, try buying some bath treats from The Body Shop, Molton Brown or Neal’s Yard to make your bath even more relaxing. Exercise is always a great way to release tension, after you drop the kids off at school if you’re not at work take some time to go for a walk, jog or find a gym or yoga class to join. You can buy a whole new gym wardrobe at Sports Direct to motivate you to get active. 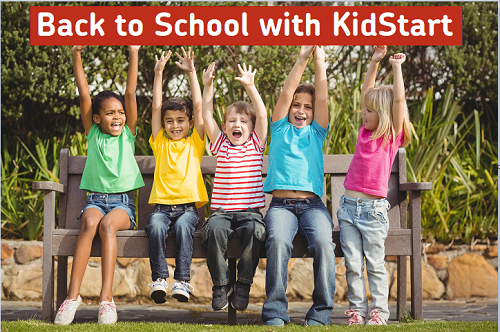 Head over to our back to school hub to find out more top tips and special offers on uniforms from F&F, shoes from Clarks and healthy food for packed lunches from Morrisons plus many more.